This week, our whole family pitched in and planted our seedlings and seeds. 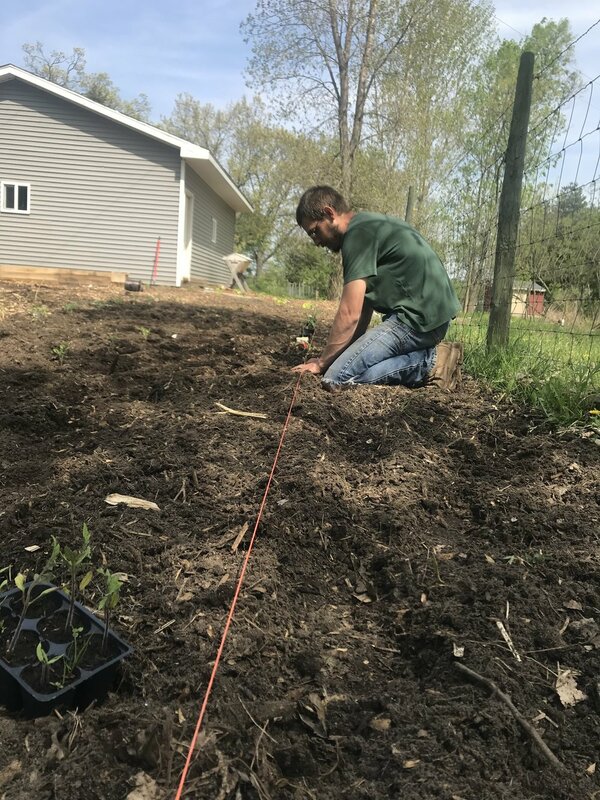 It took us most of the week, and well into the evenings after the girls finished homeschool, but the kitchen garden is planted, and it's the biggest garden we've ever planted. The new pallet raised bed is filled with seed potatoes. We've got carrots and an entire lettuce salad garden planted. The peas are in. The pole beans are in. The zucchini, cucumbers, kale, arugula. All in. And as I was patting myself on the back for all the money we saved on seeds, starting seedlings, free wood chips, building a free pallet raised bed, my wife comes home with the most expensive part of our garden and we can't even eat it. Eight boxwood shrubs to make the garden "look pretty". To say I'm happy this garden is planted is an understatement. I think back to this time last year when George and Martha were still clearing the grass away from the lawn. And do you remember the wooden stepping path I made with my chainsaw? It held up GREAT through the winter. The trick is thicker cuts and to level them out. They're not even splitting yet. Must have been all that used motor oil I stained them with that viewers yelled at me about. I get it though. The SSL Family Kids planted their rabbit garden in part of the kitchen garden, just like they did last year. I'll put up a little fence around it again, and they'll let their bunnies out to play and eat the veggies. Almost one hundred tomato seedlings were planted in long rows. Because I'm done with tomato cages. I foresee a support system a bit similar in style to the invisible trellis I've used in the past instead. The invisible trellis I built next to the house last summer is ready to be covered in cucumbers, sugar snap peas and pole beans. I am doing a little experiment this year and alternated planting them under the trellis, to take advantage of their nutrient properties so they can complement each other's needs. And the strawberries we planted last year have spread like crazy and already have strawberries growing on them. I tilled a brand new 100' garden in front of the greenhouse. It stretches all the way to and connects with the kitchen garden. I amended it with compost, and tilled it again, and hand-planted over 1,000 seeds of sweet corn in it yesterday. We have lots of seedlings left and are thinking about selling them over Memorial Day weekend. Because who can go anywhere with animals to feed, gardens to water, and hay to bale? Not us, that's for sure. My back is sore, but this work is GOOD, and we are thankful.